After the battle of Manassas the Confederate troops occupied the southern bank of the Potomac for some time. The 22d Regiment of N. C. Troops were at Evansport between Aquia Creek and Mount Vernon, Federal Troops were encamped on the opposite side of the river, which is at that point about a mile and a half wide. From this camp balloons would ascend every day for the occupants to make observations as to what was doing on the Confederate side. One very large and beautiful balloon was named “The Belle.” Every strip in the cloth, which seemed to be silk, was of a different color from the others. The Confederates had batteries along the river, and at Evansport was a long range gun which some of the members of the 22d Regiment were trained to handle. Thomas J. Wood, of Randolph County, was the gunner. He acquired considerable proficiency in firing the gun, and one day asked his Captain to let him try a shot at that big balloon. The Captain could not give the permission, but suggested that he ask General Holmes, who was then in command of the brigade. Accordingly, the first time the General came around Wood sought the desired permission. Holmes after swearing at him awhile, and telling him he would better save his ammunition for he would likely need it in a few days, finally told him he could come down, and he might try it. Two days after, a clear, bright, still evening, the balloon being up, the General came. J. J. Pettigrew, who was then Colonel of the regiment, and had had a splendid military education, was standing near the gun. Wood asked him to pass judgment of the distance. “About four miles,” Pettigrew replied. “Try your fifteen-second shell first, and if it falls short, take your twenty-two-second shell, which is made to go four miles and a half before bursting. Wood fired his first shell, and men with field-glasses watching, observed that it fell short. He then loaded with the twenty-two-second shell, adjusted his gun, and drew the lanyard. As the iron missile went singing through the air, all watched intently the result, and behold, when at last it exploded, the beautiful balloon collapsed and fell, her variegated coat torn to tatters by the fragments of the bursting shell. This is an intriguing little vignette of the early war, discovered by local genealogist Barbara Newsome (“Bobbie”) Grigg and republished in 1981 in the Randolph County Genealogical Journal. [i] However, there is a fundamental flaw with the whole story: I can find no account of any federal observation balloon being shot down by Confederate artillery. In fact, histories of the Balloon Corps say exactly the opposite. [ii] But the story provides an entry point into a number of fascinating footnotes to the story of the War Between the States. 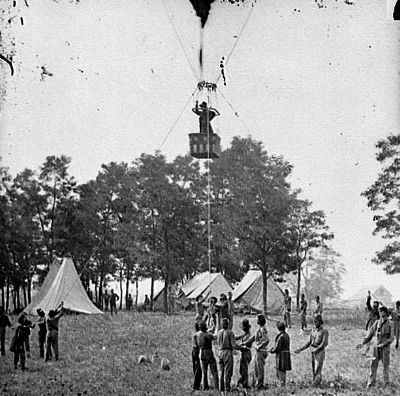 First, the United States Balloon Corps, a civilian organization established by President Lincoln in June, 1861 to provide aerial reconnaissance for the Union armies. While ostensibly under the authority of the Union’s Bureau of Topographical Engineers, the Balloon Corps and its “Chief Aeronaut” Thaddeus S.C. Lowe were never trusted by Lincoln’s mediocre cadre of command generals, and was phased out of use after June 1863, despite providing useful and, sometimes irreplaceable intelligence on southern troop strength and movements. The primary reason the War Department bureaucrats distrusted the Balloon Corps was probably what caught the attention of the President in the first place: its flamboyant founder, a character who could have been the model for Professor Marvel, the failed balloonist who became Frank Baum’s Wizard of Oz. “Professor” Thaddeus Sobieski Constantine (or, sometimes he used the more impressive and mysterious “Coulincourt”) Lowe (1832- 1913), was a self-educated aeronautical enthusiast who made a living in the 1850s demonstrating hot air balloons at county fairs across the country. Lowe made and wasn’t afraid to make use of influential friends such as Joseph Henry, the Director of the Smithsonian institution. But what got the attention of the President was a stunt Lowe engineered under the guise of testing atmospheric wind currents for a trans-Atlantic balloon flight. On April 20, 1861, Lowe made headlines North and South with a storybook aerial journey from Cincinnati, Ohio, flying 500 miles in just nine hours, sailing entirely over North Carolina to land in a field near Unionville, S.C. 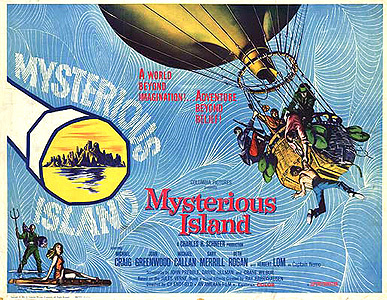 Since this was just a week after the fall of Fort Sumter, the startled residents of South Carolina were more inclined to believe that the flying Yankee disguised in a formal Prince Albert tailcoat and silk top hat was some sort of spy. They packed Lowe and his balloon, the Enterprise, off to the state capital where he finally managed to persuade the authorities to let him catch a train back to Ohio. 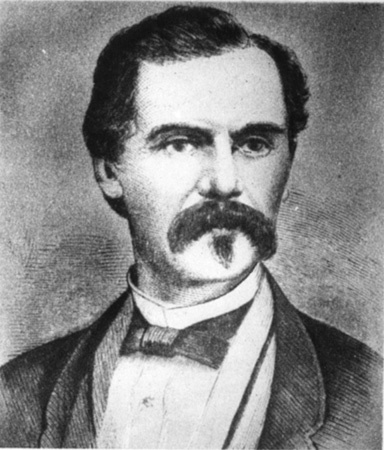 Whether or not Lowe started out to spy, by the time he got back to Cincinnati he had a firm grasp of the military value of his hobby, and a burning desire to use it in the service of the Union. He had an influential friends arrange a meeting with President Abraham Lincoln at the White House on June 11, 1861 where Lowe outlined his vision for the military use of observation balloons. A week later Lowe not only demonstrated the balloon-ship Enterprise 500 feet above the south lawn of the White House, but sent the President the world’s first telegram from the air to prove how easily aerial intelligence observations could be communicated to the ground. [iii] Lincoln wasted no time in putting Lowe to work; before the end of June balloons took their place in military history when Lowe and a sketch artist ascended near Bull Run to observe the Confederate Army. 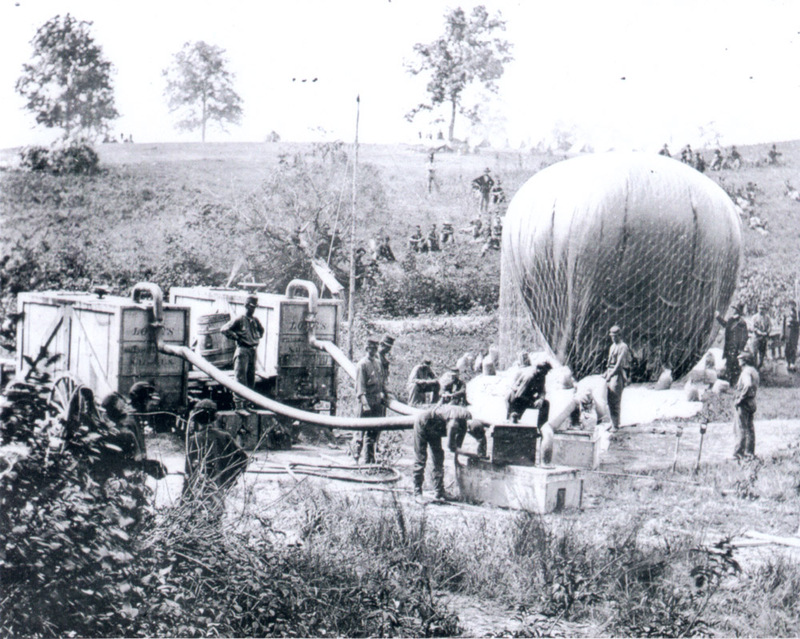 In August General George McClellan authorized Lowe to build seven balloons for the army,[iv] and Lowe invented a portable hydrogen generator to allow the balloons to be filled with gas on the battlefield. On August 29th Lowe began providing McClellan with information on the Confederate fortifications being built on the Potomac five miles south of Washington. Lowe’s daily observations of Confederate activities attracted immediate artillery and rife fire from southern troops, but at their regular altitude of 500 feet, they were usually out of range. 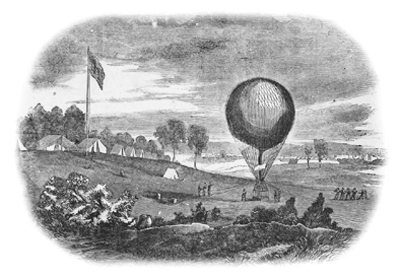 In November Lowe, observing across the Potomac from the airship Constitution, reported to army headquarters that “We had a fine view of the enemy’s camp-fires during the evening, and saw the rebels constructing new batteries…”[v] “A hawk hovering over a chicken yard could not have caused more commotion than did my balloons when they appeared,” Lowe wrote. “As soon as it became inflated so the rebels could see it,” a young Union officer wrote, “they commenced throwing shells at it… [one] shell passed directly over our heads… and exploded the instant it struck the ground.”[vi] Union soldiers made bets on whether the Southern artillerists would actually hit a balloon, but the closest shots only nicked the observer basket or the tether ropes. [vii] The balloons were such enticing targets that Lincoln’s biographer Carl Sandburg called Lowe “the most shot-at man in the War.”[viii] Despite being such a frequent target, there is no evidence that any Confederate shot ever pierced the silk envelope of a balloon; however, it may sometimes have appeared so. Major Porter Alexander, Chief Engineer and Signal Officer of the Confederate army, wrote on September 8th that “We sent a rifle shell so near old Lowe and his balloon that he came down as fast as gravity could bring him.”[ix] Perhaps something like this is the factual basis of the story. [i] The Genealogical Journal of the Randolph County Historical Society, Vol. V, No. 4, Fall 1981, p.35. 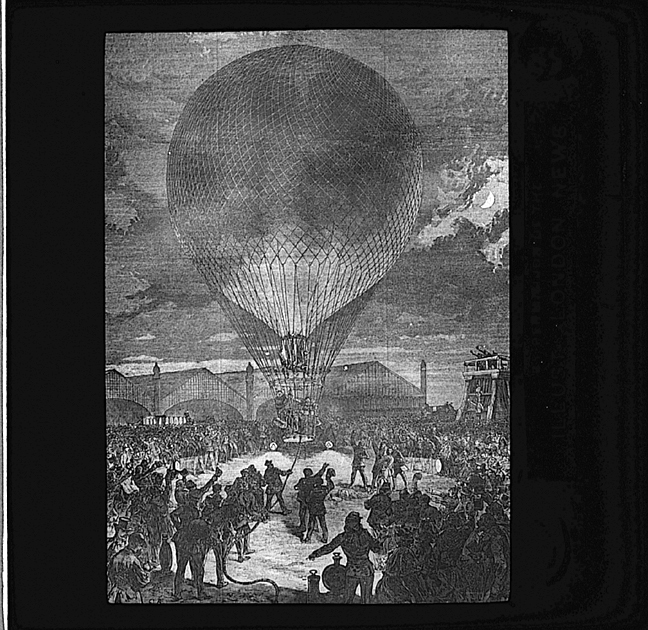 [ii] Gail Jarrow, Lincoln’s Flying Spies: Thaddeus Lowe and the Civil War Balloon Corps. Honesdale, Pa.: Calkins Creek, 2010, p. 70. [iv] Mixing naval history with pro-Union sentiments, Lowe’s airship fleet was made up of the Union, Intrepid, Constitution, United States, Washington, Eagle and Excelsior. [v] “TSC Lowe’s Official Report,” in The War of the Rebellion, series 3, Vol. 3, p. 266. [vi] Letter from Benjamin Steven to his parents in New Hampshire, 30 Nov. 1861. Benjamin C. Stevens Papers, Duke University Library Special Collections, Durham, NC. [viii] Carl Sandburg, Abraham Lincoln: The War Years, Vol. 1 (New York, 1939), page 493. [ix] Letter from E.P. Alexander to A.L. Alexander, 8 Sept. 1861, quoted in F. Stansbury Haydon, Aeronautics in the Union and Confederate Armies, Vol. 1., p. 206. (Baltimore: Johns Hopkins Press, 1941). [xi] Gilbert Adams Hays, comp. Under the Red Patch: the Story of the 63rd Regiment Pennsylvania Volunteers (Pittsburgh, 1908), p.76. [xii] James Longstreet, “Our March Against Pope,” in Battles and Leaders of the Civil War, Vol. 2, p.513. (New York: Century Club, 1888). You are currently browsing the Notes on the History of Randolph County, NC blog archives for August, 2011.